His inauguration might not have attracted “a million and a half people,” as he claims, nor has he been on the cover of Time more than anyone else in history, but President Donald Trump really has been breaking records. The estimated 3.2 to 4.2 million US participants who showed up at the women’s marches on January 21, retaliating against the inauguration of an American president who has since gathered the lowest early-term CNN approval ratings on record (36%), make up the largest single-day body of protesters in the nation’s history. Marchers also appeared in hundreds of locations outside the US, including cities in Great Britain, Canada, and Mexico. “I think people thought he was a joke so they didn’t go out and vote until it was too late,” said Sharon High School senior Kelli Small, who attributes Trump’s victory not to the lack of nationwide resentment but a failure to turn out at the polls. Hawaiian resident Teresa Shook sparked the main march (in Washington, DC) when her small-scale Facebook event on November 9 grew to attract huge interest. In Boston, event organizers predicted a turn-out of around 25,000 marchers, but ended up with 175,000. In Chicago, organizers had to cancel after the arrival of 250,000 participants. According to The Southern, many marches were the largest cities have seen since 1960’s anti-Vietnam war rallies. Politicians, celebrities, social activists, and everyday citizens spoke out and sang at the pre-march rallies. Senator Elizabeth Warren notably appeared in Boston, along with filmmaker Michael Moore and singer Alicia Keys in DC, and the cast of “Hamilton” in Chicago. Though many marchers were clear feminists, senior Juliana Goldman says most showed up to express outrage with Trump rather than shatter the glass ceiling. “A lot of the signs were…about Trump and what Trump’s said rather than purely about equality for women,” she said. 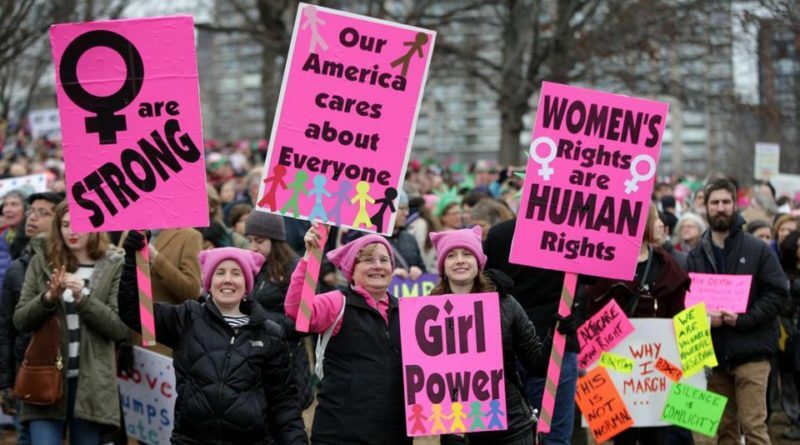 Some activists say they resent the massive success and peaceful nature of the women’s marches, pointing out that Black Lives Matter rallies never attract so many energized protesters nor face such a cooperative police force. In her popular Facebook post, author and blogger Luvvie Ajayi wrote, “White women and white bodies can hold space on streets and shut down cities ‘peacefully’ because they are allowed to,” adding that police officers often violently suppress similar black rallies. For example, after police shut down major thoroughfares at one initially peaceful Black Lives Matter rally in Atlanta, protesters began throwing bottles at tow trucks while officers made several forceful arrests. According to Freshman Jacob Dubin, the women’s marches attracted more people than most Black Lives Matter rallies because Trump’s nomination and sexist remarks touch upon a greater population. “Women are over half of Americans, while only a fraction of people are minorities,” he said. Freshman Makaila Cheung says she saw the CNN photos depicting a much larger crowd at the DC march than the inauguration the day before, but she thinks it is a biased representation. “It’s probably fake—I’m pretty sure they took [the first] after everyone left the inauguration,” she said. And one senior says regardless of the march’s success, Trump is “too arrogant and stubborn of a person to consider” conforming his policies with the protesters’ wishes. But protesters do not seem to be losing hope. According to USA Today, they may go on to comprise a “bigger grassroots organization than the Tea Party” in the coming years. 60,000 showed up at an “emergency” conference held by MoveOn.org the day after the marches to disccus the future. And on Saturday a wide body of protesters gathered at the JFK Airport in loud but peaceful opposition to Trump’s executive order to ban all travelers arriving from 7 predominantly Muslim countries. Similar protests have emerged in Copley Square, New York, and Atlanta. Maytal Cooper, a freshman at SHS, says she is confident Trump will fail to accomplish what he wants to. “We live in a place where people are really open with their ideas,” she said. Small says posting bitterly on social media or joking with friends will not be enough.